Still, Penelope was determined to have a good first day. She tried hard to make friends at recess. She finger-painted some of her best work." 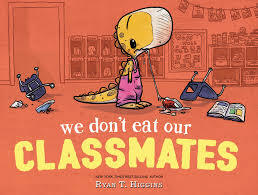 I am sorry that I didn't have this book for you near the opening of this school year. No worry! It is perfect for reading at any time of the year, as it shares a message of acceptance and understanding that we need our kids to hear. Penelope Rex is not like the other children. Why? She is a T. Rex! Imagine her surprise when she attends school for the first time and realizes that her classmates are CHILDREN. There is one thing Penelope knows about said kids - they taste delicious! So, she's not off to a good start. But for eating her classmates, Penelope is pretty much the same as them. She's nervous about starting school, she wonders about the others who will be there, she has a backpack and a lunch. Her teacher is not impressed with the disappearance of her students and tells Penelope to spit them out! She does so, leaving the children covered in dinosaur goo .... ewwww! Readers will love it! She spends the rest of the day trying, but finds little acceptance there. Her report to her father at the end of the day results in some gentle parental advice. Try as she does, they are just too tempting. Then, she meets Walter, the class goldfish. Walter teaches the lesson Penelope needs to learn. Everything changes for the better! Ryan Higgins' characters are charming in every way. They freely show their feelings, as Penelope struggles to find a way to be a friend. The background colors are muted, while diverse characters are bright spots of color. The tone is humorous and optimistic, and the ending is a wonderful surprise.